We’re in a time when the bygone-but-living legacy of older Cuban music has taken on new relevance, with the sneak attack success of the Buena Vista Social Club and subsequent solo recordings by that project’s once- dormant senior musicians, and the increasing influence of the son-dedicated group Sierra Maestre. 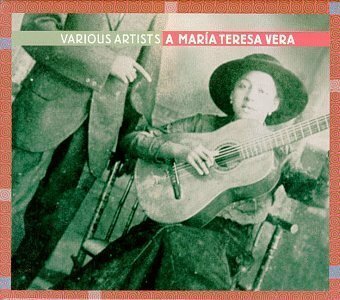 Into that continuum falls a new tribute album, A Maria Teresa Vera (Intuition/Nubenegra 3193; 62:41), on which various artists interpret the songbook of a Cuban legend who lived from 1895-1965, recorded on the centennial of her birth. A popular singer and songwriter who made her voice heard in a man’s world, she became an icon of Cuban song, and the strength of that material comes through here. Romantic and bold, and often with insightful lyrics, the tunes are treated in a modern but respectful way, by artists including Uxia, Maria Salgado, Gema Y Pavel, Omara Portuondo and Jacqueline Castellanos, who sings “La Rifa-” “The Raffle-” a clever gambit about social ills. The song was originally recorded by Vera for Columbia in 1920. Here’s history, in the making, in the already-made.